Football, otherwise known as American Football is a sport involving two opposing teams of players competing for territory on a football field using a ball and set play with the objective being to get the ball to the goal line of the opposing team either by scoring a running touchdown or kicking the ball over the post and between the uprights of the goal. Unlike soccer, football does not have a goal defender, instead it is more similar to Rugby and Australian Rules Football where all team members play a defensive and offensive role during the game. Rugby, the predecessor to Football was invented in England during the 1860s although its antecedents are common to soccer and date back to at least the middle ages when groups of rival villages would compete to score a goal using filled or inflated pigs bladders that were held and run with until the player was tackled and lost control of the ball.A goal was scored when the ball was picked or carried thru to a designated point like the church doors or a post erected in the village square. During the 1860s in England a number of public schools, universities and working mens clubs got together to form a set of rules that would allow teams from different schools or districts to play against each other. The rules that were ultimately published were the forerunner of modern soccer, but were not accepted by all teams who refused to join the new association and instead chose to create their own code known as rugby that allowed picking up the ball and tackling of opponents. Whilst the rules of football can be traced to the English parent games, in fact American Football is also indigenous to North America and older versions of the sport were played at Princeton in the early 1800s. The game was called ballown and involved passing and punching the ball along the field and past the opposing team to score. Eventually the game became known as football but the rules changed from year to year as new students took it up. At Harvard University a similar game was played on the first Monday of the academic year by freshman and sophomore students to the great enjoyment of senior students. The game was called Bloody Monday and was considered a good ice breaker for letting new students get to know each other. The name Bloody Monday was no accident, but wasn’t a free for all, there was an objective to be met, to win by scoring goals. Soon after the rules of soccer and rugby had been agreed on in England the US entered a new period of prosperity brought about by the end of the civil war. Rutgers and Princeton independently created their own rules of play, and on the 6th November 1869 played the very first intercollegiate game of football. Princeton lost by two goals, scoring only four goals to Rutger’s six, but college football was born. Not long after intercollegiate games became popular and in 1873 representatives from Rutgers, Princeton, Yale and Columbia met to formulate a set of rules that would be used for future intercollegiate games. They established the Intercollgeiate Football Association and adopted many of the rules used in rugby, reducing the number of players per team from twenty to fifteen and setting the length of the field to 140 yards. Being very similar to rugby, football in the Americas had its dissenters, namely Walter Camp of Yale who wanted a shorter playing field and less players fielded down to just eleven at any one time. 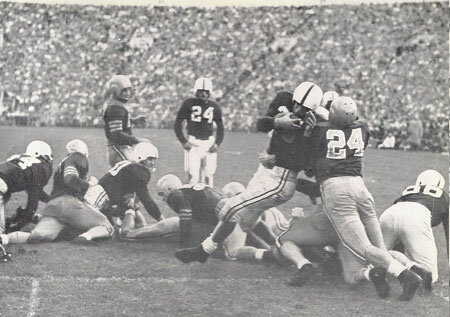 As a senior member of the IFA rules committee Camp was influential and not long after the first rules were drawn up Camp and Yale got their wish, the field was reduced to 110 yards and the number of players brought down to eleven. American style football had been born and proved more popular with American players and audiences than the older rugby styled game. Colleges all over the United States adopted Camps new rules establishing American Football as the leading football code within a very short time. In 1882 Camp and the rules committee brought in the new system of three downs, a further change from rugby that allowed the team with possession of the ball to retain possession until the completion of their set play. 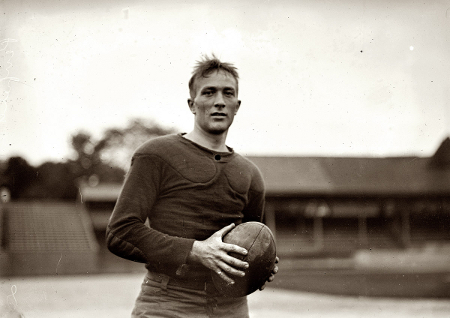 During the 1890s many colleges banned the game for being too rough and brutal with horrific injuries being reported and despite and enlarged rules committee representing over 60 colleges things didn’t improve much until President Roosevelt who was a keen follower of the game called on the National Collegiate Athletic Association (NCAA), the successor to the IFA, to eliminate brutality from the game. The forward pass rule was instituted that almost immediately eliminated the mass scrums that had been the cause of so many injuries and opened up the gam to wide running play that is the hallmark of American Football even today. The number of downs was increased to four, and the distance of play between downs increased from five yards to ten yards. So successful were the new changes to American Football that non college teams based around community athletic clubs formed and began to compete against each other, often players were paid their time, and in 1920 the National Football League (NFL) was formed. The rules of play were the same as for college football with the noted difference that players became professional and no longer had to work a separate job. 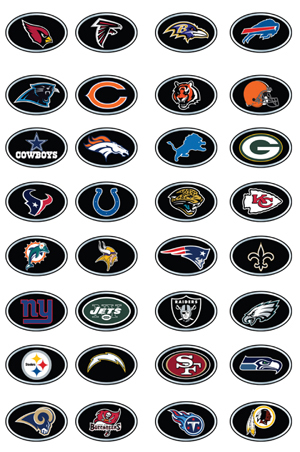 By the 1950s professional football and the NFL franchise had begun to dominate with ever increasing viewer numbers and network television broadcasting most major games. A rival association, the American Football League (AFL) started in areas not already serviced by NFL teams and quickly started to compete for the best players, viewing numbers, and network broadcasting contracts. The merger of the AFL and NFL in 1970 into a 26 team franchise has been described as a defining moment in American Football history. A stronger league emerged and created the Super Bowl as its defining championship game, but most importantly the revenue sharing model in place has meant that every team has a chance of competing in the Super Bowl. This is in stark contrast to other codes where major teams manage to dominate their league.